Within two minutes of talking to Dr Richard Bowman, in his lab at the University of Bath, he’s guiding me through the physics of tractor beams in Star trek. He’s using it as a simile to explain the complicated subject of optical tweezers to a stupid person. He does so in a charming way, as someone familiar with explaining his complex field to journalists, but it’s clear why he’s a Prize Fellow and Royal Commission 1851 Research Fellow – his explanation ends with our imaginary tractor beam melting an object it’s trying to move before Bowman shrinks this entire sci-fi example down to demonstrate how he’s used laser beams in his past work to move tiny objects. On the face of it, Dr Bowman’s story is that he’s on a three-year project to build a general-purpose 3D-printed microscope, but his ambitions are bigger and, ultimately, he wants to create 3D-printable ‘building blocks’ that others can use to make affordable, new experimental apparatus. “Opening up hardware means more people have access to it,” says Dr Bowman. As well as being a co-founder of WaterScope, a project developing faster and easier-to-use water-testing field kits that use a microscope he designed, he’s a passionate advocate for open hardware and works with organisations like GOSH (the Gathering for Open Science Hardware). The situation was frustrating and not as efficient as it could be but then – at Queens College, Cambridge University, where he was working in a nanophotonics group and dealing with automated microscopy – he began meeting people interested in open source hardware: “I met someone who was building a 3D-printed microscope and it looked a lot like this,” says Bowman pointing to a RepRap 3D printer nearby. Dr Bowman explains that if he unscrewed the lens and pointed it at the object he wanted to look at – putting the lens some distance away from the sensor – it would function as a microscope. The expensive part for serious science work, then, is building a mechanical stage for fine control of what you want to look at. 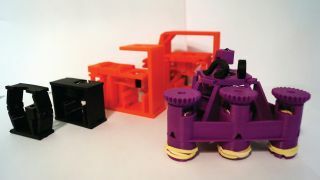 “A Raspberry Pi Camera Module is £25, but the mechanical stage might then cost you £1,000 or easily more than that.” So Bowman began a process of researching and prototyping mechanical stages. You can see some of the iterations pictured in the image at the top of this page: the key step up, which Bowman describes as a “middle of the night” epiphany, was having the sample sit on a table (the last red microscope in the top image) that has legs designed to bend in a way that allows for the crucial focus control and movement on the X and Y axes. Bowman’s larger microscope with a motorised stage, which he demoes to us, uses Python scripting for enabling the user to move the field of view around the slide. The aim is to add more features such as auto-focus and the ability to stitch all the images back together for a digital representation.